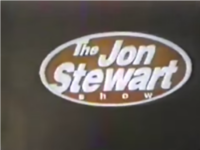 The Jon Stewart Show was a late night talk show that was hosted by comedian Jon Stewart. The program premiered on MTV in 1993 as a thirty-minute daily program. At the end of its first season, MTV's then-corporate sibling Paramount Domestic Television retooled the program, extended it to sixty minutes, and used it as a replacement for the canceled Arsenio Hall Show for the 1994"?95 television season. While the show garnered high ratings on MTV, it was not a success in syndication and was canceled in 1995. This webpage uses material from the Wikipedia article "The_Jon_Stewart_Show" and is licensed under the GNU Free Documentation License. Reality TV World is not responsible for any errors or omissions the Wikipedia article may contain.